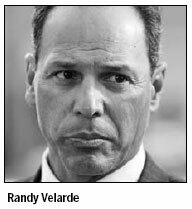 SAN FRANCISCO, California - Ex-New York Yankee Randy Velarde testified on Wednesday he received human growth hormone (HGH) from the personal trainer of Barry Bonds, who is accused of lying under oath about his use of performance-enhancing drugs. Velarde was the fourth Major League Baseball player to tell jurors in Bonds' perjury trial that he got banned drugs from Bonds' trainer Greg Anderson. Bonds, who holds the Major League records for single-season and career home runs, told a grand jury in 2003 that he took substances from Anderson he believed were flaxseed oil and arthritis balm but did not knowingly use steroids. He also said Anderson never injected him. Bonds is accused of lying in that testimony, and is charged with four counts of perjury and one count of obstruction of justice. He has pleaded not guilty. In federal court on Wednesday, Velarde said that during a series of meetings in parking lots in 2002, Anderson gave him some pills, and then injections that included HGH. "I explained to him that I wasn't getting any effect with the pills," he told the jury of eight women and four men. "He said the next step would be injections." Anderson would administer the arm injections with a large needle, Velarde testified, and he would inject himself in the stomach with a smaller needle. He wasn't sure if Anderson had ever injected him with anything other than the growth hormone. "I just knew they were injections," he said. Whatever the substances were, they gave him "more endurance, more strength", Velarde said. Unlike players who have testified previously, Velarde said Anderson never gave him designer steroids known as "the cream" or "the clear" - the drugs Bonds told the grand jury he believed were flaxseed oil and arthritis balm. Anderson has served time in prison for dealing steroids, charges brought in connection to the BALCO steroid distribution scandal. He is back behind bars for refusing to testify in this case. Without Anderson's testimony, the government is hoping to use Velarde and other players who say they got banned drugs from the trainer to argue Bonds knowingly received the same drugs and was not duped into taking them. Before Velarde took the stand, defense attorney Allen Ruby cross-examined Marvin Benard, a former San Francisco Giants teammate of Bonds, about his assertions Anderson gave him steroids. Ruby pointed out that in grand jury testimony in 2006, Benard never testified Anderson identified the substances specifically as steroids. He accused Benard of repeating what prosecutors had told him to say. "They wanted you to say that Anderson told you he was giving you a steroid, right?" she said. Benard previously testified he began getting performance-enhancing drugs from Anderson after the trainer advised him against taking animal steroids he had acquired in Mexico. "He just said there was better, cleaner stuff that I could use instead of that and he could help me out with it." The government was expected to wrap up its case on Thursday with testimony from Bonds' former surgeon and a former personal assistant who is expected to say she saw Anderson inject Bonds. The defense will begin calling witnesses next week.